Artists are invited to apply to the Community Commissions 10th Anniversary open call! To commemorate its 10th Anniversary, DOT Art is soliciting proposals to commission temporary artwork in partnership with long standing agency collaborators for five signature sites that have been home to multiple art installations over the past ten years. Selected artworks may remain installed for up to 11 months and selected artists are eligible to receive up to $12,000 toward direct project costs. Bronx Children’s Museum is entering a significant phase of planning where we intend to work closely with the Bronx artist community. Therefore, we request that artists who are residents or have a strong connection to the Bronx respond to this RFQ. The 3rd Annual En Foco Photography Fellowship is designed to support photographers of color who demonstrate the highest quality of work as determined by a photography panel of peers and industry professionals. Another great event in the Bronx! We had a blast at the opening reception for Jamel Shabazz: Black Documents and Black Documents: Freedom, two photography exhibitions presented by Literary Freedom Project and curated by BX200’s Laura James. Site 5 DSA Owner LLC seeks proposals from artists for a mural on the façade of an exciting new development on the Lower East Side in the Essex Crossing project. The mural will be one of the largest of its kind in New York City. Request for Qualifications: The Bronx River Art Center (BRAC) invites visual artists, designers, architects, landscape architects, and creative engineers with experience in arts productions in the public realm, to submit qualifications for consideration to produce temporary public art installations in the most recently completed segment of the Bronx River Greenway — Starlight Park. Applications will be accepted from professional artists over age 21 and not enrolled in school. Bronx-based artists are encouraged to apply. 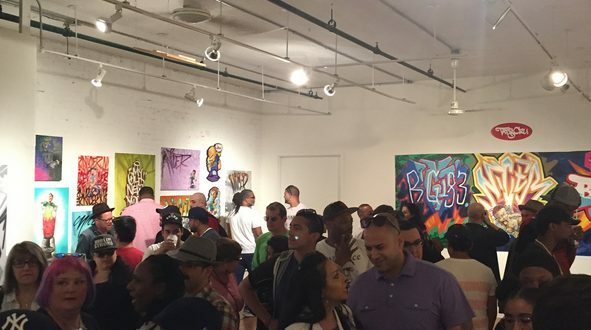 What a great time we had at The Art of TATS CRU opening reception and block party celebration! We loved meeting SO MANY fans of TATS and BronxArtSpace neighbors.